ClotCare is a charitable 501(c)(3) non-profit organization. 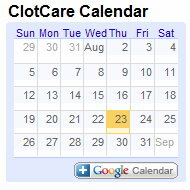 ClotCare Online Resource is provided as a free service to its users. ClotCare does not receive funding from advertisements. Rather, it is due to unrestricted educational grants*, sponsorships, and individual donations that we are able to provide ClotCare as a free resource. If you would like to help support ClotCare, click here to learn how you can make a tax-deductible donation. "In honor of my husband Edward Czachur who has survived this and still recovering"
In celebration of Edward Schultz, father of Kylie Schultz ~ by the EcoTrek Fitness family! Ms. Schultz made a donation in memory and honor of her husband, Edward Schultz, who died suddenly from a pulmonary embolism on March 27, 2012. In celebration of Sheri Caldwell, our fearless leader and friend, the employees of The Caldwell Group donate $150 in her honor to help support the continued growth of ClotCare Online Resource. You are an inspiration to us, Sheri. Thanks! Bonnie B. Echols in honor of Dr. Henry I. Bussey, Jr.
Barbara and Jim Higdon in memory of Carles R. McIntosh, Sr.
Julie Jenkins in memory of Charles Richard McIntosh Sr.
Past industry sponsors include Upsher-Smith, Boehringer Ingelheim, Aryx Therapeutics, AstraZeneca Pharmaceuticals, Bristol-Myers Squibb, Celgene Corporation, Ortho-McNeil-Janssen Pharmaceuticals, and Pfizer. *Unrestricted industry support means that the companies who support ClotCare provide financial support for the site but have no input into the content of the site.